Topics: Church Departments, Sermons, Community, Check Mail, and Abundant Life Centre. Its 2 nameservers are ns2.nocserver.net, and ns1.nocserver.net. Cogswell Enterprises Inc (Illinois, Chicago) is the location of the Apache server. 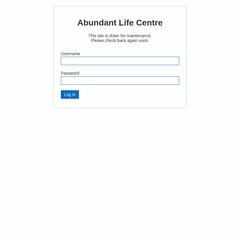 Abundantlifecentre.org's server IP number is 96.30.57.68. PING (96.30.57.68) 56(84) bytes of data. A ping speed test response, is timed at 25.2 ms.